she did differently that made the difference. Are your ad reps increasingly coming back to the office feeling beat up and demoralized, attributing it to the digital age and the economy? It doesn't have to be that way, as this incredible case study from one of my clients illustrates. A simple shift in an ad rep's sales approach can make overcoming objections a breeze and result in a major jump in print and digital revenue, leaving one ad manager to describe their ad sales as ON FIRE!!! This case study begins with an ad rep who gave a classic consultative selling-type presentation, one that would make any ad director proud. But, as happens a lot these days, the business turned her down, in no uncertain terms. They claimed they had no money. That print was dead and it just didn't work. That digital worked even less (unless it was pay-per-click). That the weak economy was making it hard to justify spending anything. Sound familiar? The ad rep was felt like she was banging her head against a brick wall. But two days later, she returned and tried again with a different approach and this time sold a 5 col. x 14" ad on a 13 x contract. She spoke to the same person. She showed the same spec ad she had presented before (from our ad sales coaching service). It was the same information about her print and digital products and how they fit the prospect's needs. She used the same information she had gathered from the original "fact-finding" call. The ad recommendation was the same size, frequency, and rates she quoted the last time. How is this possible? Both times, all the above elements were perfect (we're sure–we helped her with a lot of it.) But the second time there was a seriously different outcome by just by changing her wording. In fact, this technique works so well, two large newspapers independently told me recently: "If every newspaper was using this sales approach, the industry wouldn't be complaining sales are down." The real problem at the heart of declining local ad sales (and how to fix it). troubles are blamed instead of the ad. What exactly changed? The first time she presented the ad, she had a sound strategy (and it looked great, too), but the advertiser didn't believe it would work. Advertising is subjective, after all, and a big ad with lots of copy didn't happen to fit into his own approach (which you can see to the right). Because his previous ad, which he liked, hadn't shown any results, it was difficult for him to conclude anything other than what he's constantly hearing–newspapers are dead. And so was the sale. This exact same phenomenon is now happening in digital, too. And it's worse, because everything is so measurable. That's a big deal, because when we allow an advertiser to fail at digital, too, they may never return to either medium and start running, say, pay-per-click ads through Google instead. Or settle for Facebook. And Twitter. That's how you run a newspaper into the ground. So, what did she do differently? To her credit, she went back and watched my videos where I role-play the entire kitchen presentation. She got the new approach down and went in again with the same materials, but this time she first changed the prospect's underlying, faulty theories about print and digital that were getting in the way of him believing the new strategy would work, teaching him an effective, direct-response system of advertising. We call it the "Response Model". Once he bought into that, she then went on to show the prospect how she applied this Response Model to the information the he had given her and proceeded to help him visualize the new strategy. Only then did she show the ad. I got this email from her manager later that day. "Tanya presented the ad today (again). He loved the ad. Did not object because she did such a nice job on having him imagine the ad as we went along on the response model. I am so PROUD OF HER!!!!!!!! We are looking at a 13 week commitment. We are on FIRE." This isn't a fluke. The ad manager said they've sold every ad they're presented so far. 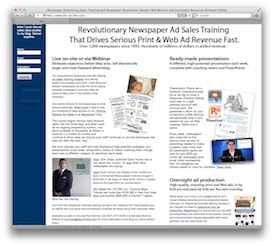 That's why many newspapers–dailies, weeklies, and monthlies alike–who make sure their ad reps take a few minutes to ensure their prospects' theories about advertising are correct before presenting, describe their ad sales as on FIRE. Ad revenue doesn't need to be down. But ad reps who are treating spec ads as little more than a decoration, in effect saying, "trust me" on the ad strategy side are killing your newspapers more than the economy or the new age of digital ever will. Prospective advertisers have to believe every dollar is going to come back to them tenfold. They have to believe in the strategy. What made the difference here is that Tanya went back and spent some time drawing the prospect through a solid, step-by-step approach to creating print and digital strategies that work the first time. The result? An advertiser who could visualize getting a response from a huge ad and understood exactly why the ad needed to be the size it was, needed the frequency, and needed every word of content. No arguments. No objections. Just an extraordinarily happy advertiser. Want to learn more? Sign up for a 30-minute demo and learn how your staff can do exactly this with our inexpensive, all-on-one service that combines live training Webinars with weekly, category-specific coaching videos, complete with stunning spec ads and PowerPoints. Or call me at (631) 477-2505 and I'll fill you in on the details of how your ad reps could be killing it on every sales call. And give your ad reps some ammunition when your prospects tell them they have no money, it's the economy, or print is dead.